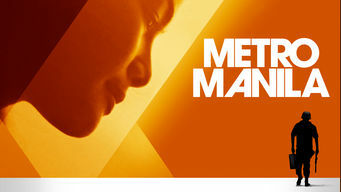 How to watch Metro Manila (2013) on Netflix Bangladesh! Sorry, Metro Manila is not available on Bangladeshi Netflix, but you can unlock it right now in Bangladesh and start watching! With a few simple steps you can change your Netflix region to a country like Egypt and start watching Egyptian Netflix, which includes Metro Manila. We'll keep checking Netflix Bangladesh for Metro Manila, and this page will be updated with any changes. Metro Manila is not available in Bangladesh BUT it can be unlocked and viewed! Seeking a better life, Oscar moves his family from a farm to the bustling city of Manila, where they soon realize that they're out of their element. Things reach a boiling point when Oscar's job at an armored truck company threatens his very life. Finding your feet on sizzling concrete isn't for wimps. A former farmer armors up before the city eats him alive. There is a way to watch Metro Manila in Bangladesh, even though it isn't currently available on Netflix locally. What you need is a system that lets you change your Netflix country. With a few simple steps you can be watching Metro Manila and thousands of other titles!